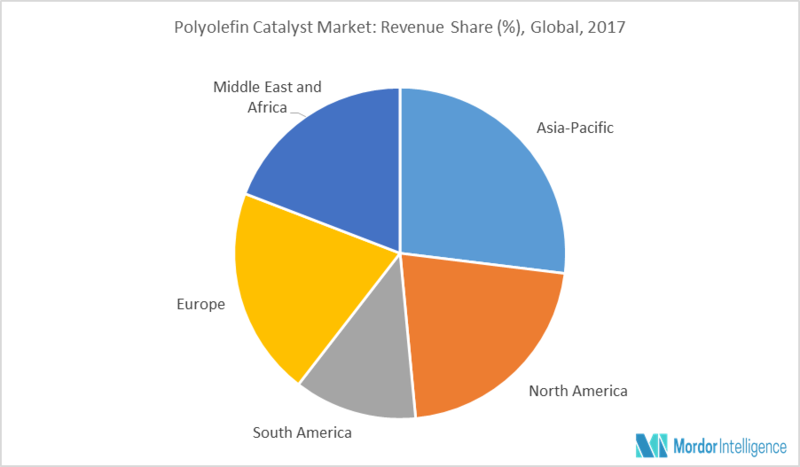 The global polyolefin catalyst market was valued at USD 1,807.93 million in 2017. Asia-Pacific is set to lead the market with a larger share owing to the presence of a great number of chemical companies in the region. Film application accounts for the largest share and is also the fastest growing segment. Polyolefin is used widely for numerous applications, like injection molding, blow molding, etc., across various end-user industries, which include electrical & electronics, automotive, construction, and medical and consumer. In addition to this, the rising number of vehicles around the globe, particularly in the Asia-Pacific region, has also increased the demand for polymer resins. Increased use of plastics as a substitute for glass and metal products, development of new products, and increased sophistication in plastic processing methods are some of the major factors that have led to the expansion of polymer and resin production in these industries. Many countries in the Asia-Pacific region, particularly China and India, are expanding their polymer resin production to reduce the dependency on import. Films and sheets are manufactured by either cast film or blown film extrusion technology. In cast film extrusion, hot plastic is extruded through a flat, slit die onto a polished chill roll, where it is quenched, pulled to a second set of rolls to cool the other side, and then wound. In blown film extrusion, a tube of molten polymer is extruded through a die and inflated to several times its initial diameter to form a thin film bubble. The bubble is then collapsed and used as a lay-flat film. Polyolefin films are majorly used in industries, like packaging, agriculture, and construction. Continuous growth of these industries has made films the largest and fastest-growing segment in the application segmentation. Major companies producing polyolefin films are Sealed Air Corporation, PMC Group, Inc., Asmaco Industries Limited, Yorkshire Packaging Systems, and Vijay Packaging System, among others. China is a major producer and consumer of polyolefin in the world. The demand for polypropylene reached approximately 23.7 million in 2017, which indicates a higher demand as compared to the previous year’s demand, by around 1.2 million. The country experienced a surge in the import and domestic production of polyethylene in the first half of 2017. With the increasing demand for polyolefin, the country is expected to witness expansion in production capacity to meet the domestic demand. October 2017: Clariant scrapped the USD 20 billion merger between Clariant and Huntsman. Major players in the market are Dow Chemical Company, WR Grace, Sinopec, and Albemarle Corporation, among others. To understand the impact of increasingly stringent regulations on the market. 8.3 Chicago Bridge & Iron Company N.V.
8.13 Lyondellbasell Industries Holdings B.V.